I picked this book up rather randomly off a library shelf based on the title. Though the cover art did not do much for me, I liked the promise of an interesting story that the blurb held, so I took it home. I’ve been on a bit of a YA kick lately – but have been disappointed by how formulaic the newer YA stories have become lately. Princess Ben, however, was something rather unique. I really enjoyed this book – despite it being told in first-person (not my favorite). As it is sort of memoir-style, the past tense helps the first-person not be terribly annoying. This is not your typical love-triangle, macho heroine (who we’re not sure why she has two fabulous boys fighting/swooning over her), survival-of-the-fittest type stories. 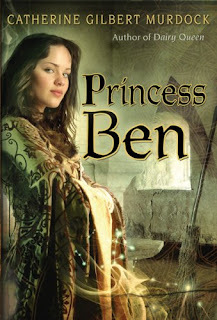 Instead, Ben (Benevolence) is a reluctant princess, who at first gets everything wrong. She eats too much, she has no manners, she refuses to learn anything a princess should know, and she ends up putting her country in great peril. Along the way, she learns some very hard lessons – mostly about herself – and has to make a concerted effort to change. This change is hard won, and comes about after great personal danger and trial. However, when she puts her mind to it, she shows herself to be quite capable of being – if not the perfect princess – then at least fully competent, intelligent, and able to learn from her mistakes. Which is why the reader will end up growing to love her. I gave the book 5 stars and would definitely read it again. Thank you for the link you left on my blog! I am going to look into it, anything helps right now. In answer to your questions about how I found authors to read my book. First I looked for authors who wrote the same genre. I mostly looked for ones who were kind of well known, but not famous. (For example, there is a man named Scott Westerfeld who wrote a Steampunk series, but he is very famous and I doubted he would have time or be willing to read and review a book by an unknown author.) Instead, I researched authors who were kind of just starting out, but had more books out than me. And who hadn’t self published. I hope this helps! And I hope you can find an author willing to do it!